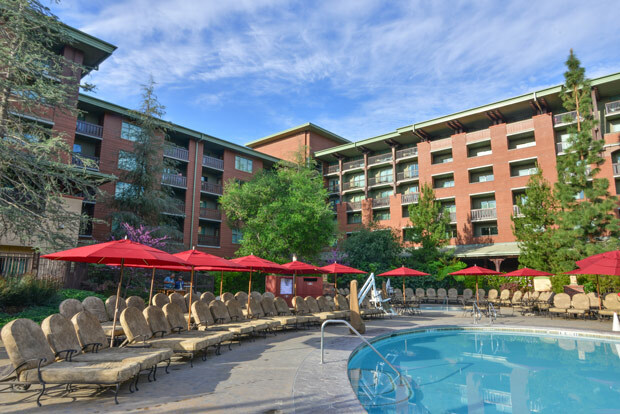 The magnificent Grand Californian Hotel is located in the Disney California Adventure theme park. Being in the “Middle of the Magic” has new meaning when your hotel is part of the experience. Fringed by pine trees, this six-story hotel is a tribute to the Arts and Crafts movement made popular in the early 1900s. No detail was missed in echoing this style with its emphasis on warmth, artistry and nature. The “Art of the Craft Tour” is offered for guests wishing to learn more about this era and its influence on the design of the hotel. As you pass through the beautiful stained glass doors, you enter into the spectacular lobby. Warm woods line the walls, with Mission style lighting complementing the décor. Scattered throughout are inviting sitting areas. The carpet’s pattern blends seamlessly into the surrounding tile floor. You can pull up a chair and enjoy this amazing space while a piano player entertains you. A stately fireplace combining stone, tile and ironwork takes center stage. The continuously burning fire is the perfect gathering spot. Throughout the day there are storytelling sessions in front of the great hearth. The upper floors overlook the atrium, and offer cozy nooks for relaxation. With soothing shades of taupe, burgundy and green used throughout the décor, a combination of comfort with elegance is achieved. 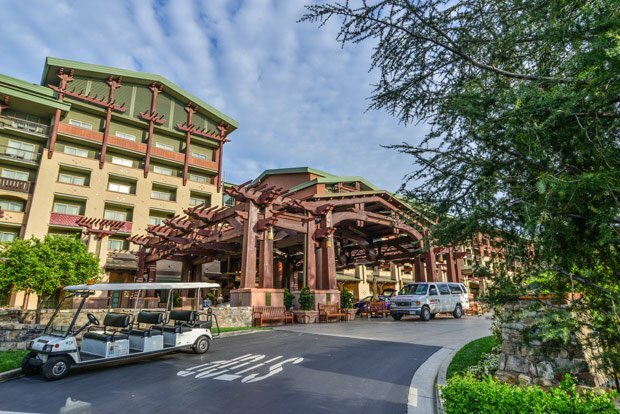 There are 948 guestrooms at the Grand Californian, including 44 suites and 71 villas as part of the Disney Vacation Club. There are two Presidential and two Vice-Presidential suites. The standard rooms are 356-380 sq. ft. and have either two queen beds, a king bed, or one queen bed with bunk beds. Amenities include iron/ironing board, mini-bars, in-room safes, hairdryers, Keurig coffeemaker and bathrobes. Complimentary USA Today newspapers are available in the lobby. 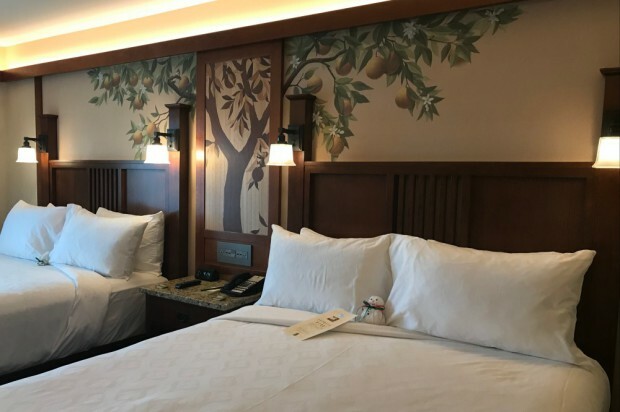 The rooms, which were renovated in 2017, feature bed coverings that are crisp white and an orange tree mural reflecting the history of Disneyland. Look for Chip 'n Dale hiding in the branches. Most of the rooms have balconies. In the midst of this “woodland”, the Monorail passes through the central courtyard reminding guests that they are indeed in Disneyland. The Concierge lounge is located on the sixth floor. 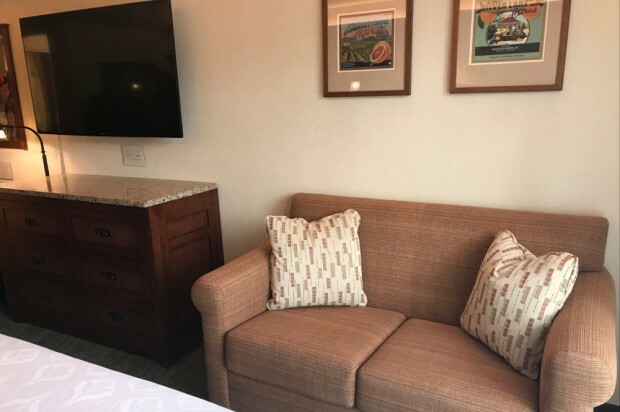 Guests staying at this level enjoy priority check-in, breakfast bar, twilight wine and cheese reception, USA Today, complimentary DVD checkout and use of the fitness center. In the evening, story time is held for the children with milk and cookies served. The forest theme is continued outdoors. Carefully chosen plants and trees set amidst rock outcroppings lend the feel of being in the northwest environs of California. Tucked away is an outside fireplace where you can pull up a rocking chair. On the fifth floor of the hotel, an inviting outdoor terrace that overlooks the pool is found. The Redwood Pool features a 100-foot slide that winds around the trunk of an ancient tree. The attached Fountain Pool provides a more restful setting while the kids can enjoy their very own Mickey shaped pool. 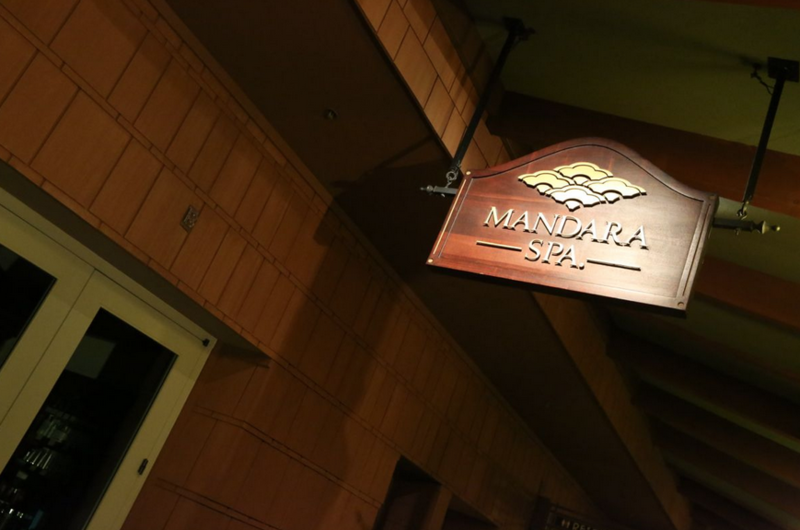 The Mandara Spa is a world renowned facility where you can indulge in a relaxing massage, skin treatment or salon service. 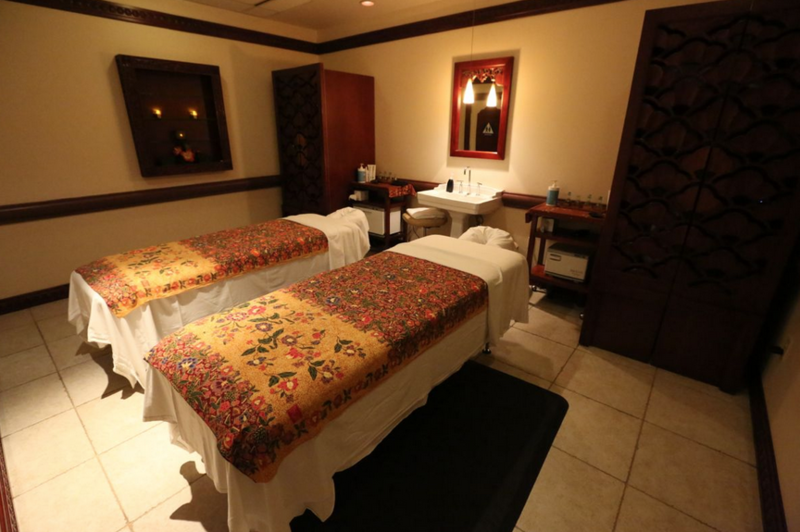 The tranquil Balinese themed setting is perfect for relaxation. There are eight exotic treatment rooms, co-ed lounge, expansive couple's pavilion and full serve nail pavilion. 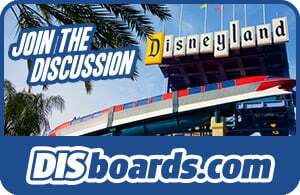 Guests of the Disneyland Resort hotels are are eligible for an Extra Magic Hour. Visit Disneyland on Tuesdays, Thursdays and Saturdays and check out Disney California Adventure on Sundays, Mondays, Wednesdays and Fridays up to one hour prior to regular park opening. The availability of the Extra Magic Hour and offered attractions is subject to change. Get Up & Go Power Walk - Walk while enjoying the sights and sounds of Disney California Adventure before opening. The Beauty Studio at Sephora - Guests will receive a consultation of their choice with beauty expert, personal shopping time and a goodie bag. Nominal fee of $45, which will be placed on a gift card to be used towards a same-day, in-store purchase. 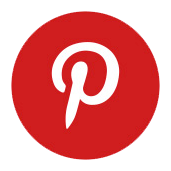 Washcloth Creations - In-house experts from Housekeeping will show you how to make your very own rabbit or other creations out of a washcloth. 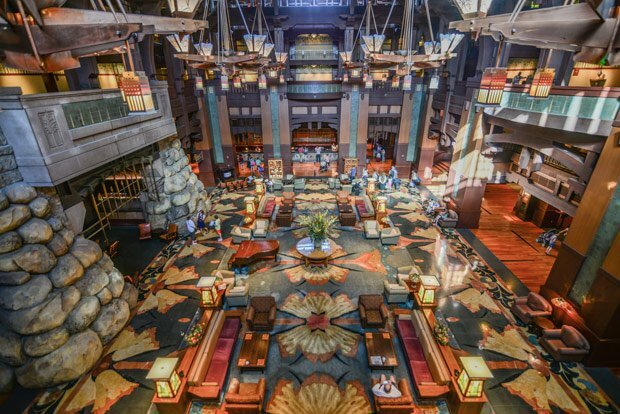 Art of the Craft Tour - A guided walking tour of Disney's Grand Californian Hotel & Spa. From the simple to the sublime, a wonderful selection of dining choices is found here. White Water Snacks offers self-serve breakfast, lunch and dinner in a casual setting. 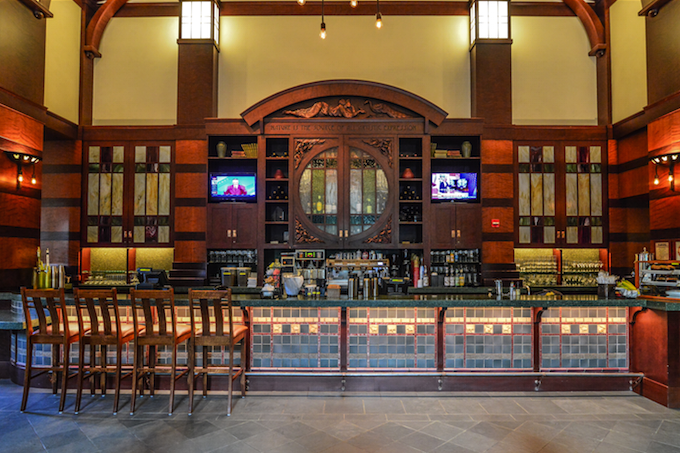 The Hearthstone Lounge located inside the main building is a comfortable spot to enjoy a continental breakfast in the morning and cocktails or coffee later in the day. In keeping with the theme, this spacious lounge is completely lined in wood. What’s interesting about this is that all of the wood came from a single fallen redwood tree. 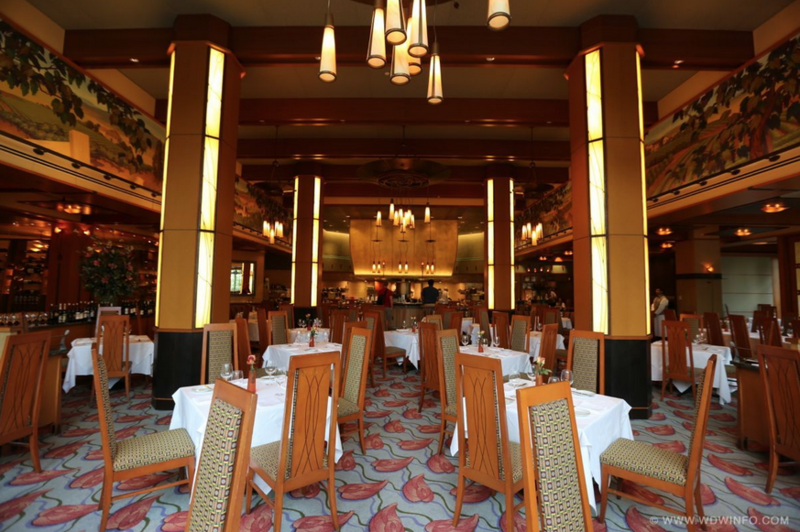 If fine dining is what you’re after, the Napa Rose Restaurant is not to be missed. Dining at this award-winning restaurant is an experience. Using the freshest ingredients, each dish that is carefully prepared in the open-air kitchen is a culinary delight. From the tempting basket of breads to the sinfully delicious desserts, each course is to be savored. True to its namesake Napa valley, there are over 250 wines to select from, with 40 wines by the glass available. If you prefer, you can choose to enjoy the adjacent Napa Rose Lounge. With cozy club chairs surrounding the fireplace, this relaxed setting is the perfect spot to enjoy a glass of wine, as well as an item from the menu. There’s a terrace outside of the Napa Rose with a welcoming fire pit where you can relax and enjoy its warmth. 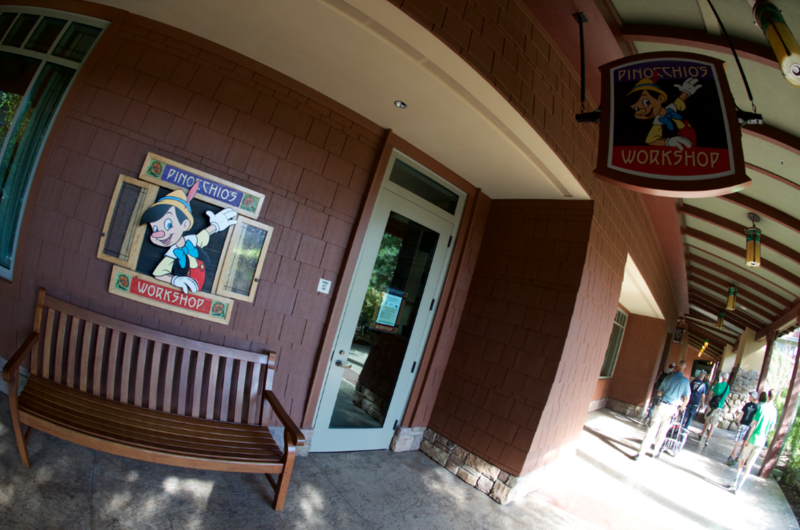 Being that the Grand Californian Hotel is in the theme park, it has it’s own private entrance to Disney California Adventure. It’s also within a few steps of Downtown Disney making it a prime location for easy access to the parks and entertainment. 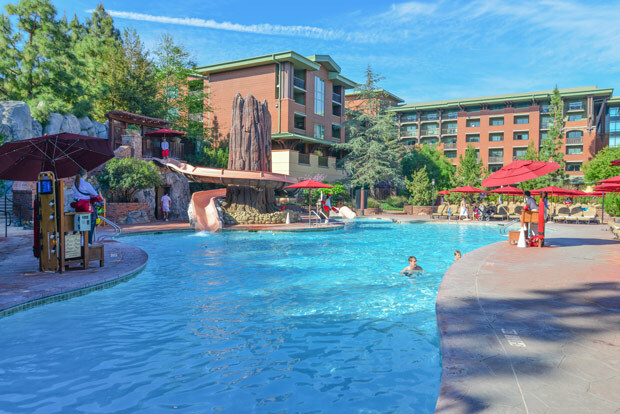 The Grand Californian Hotel well deserves the accolades that have been bestowed upon it from when it first opened its doors. 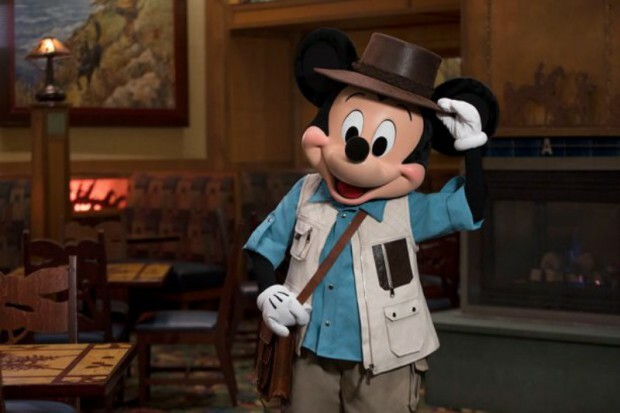 With refined gracefulness, guests can expect to find the very best that Disney offers.